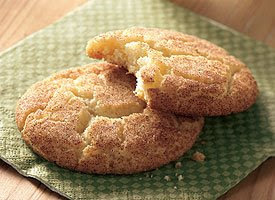 The origin of the name “Snickerdoodle” has given rise to many theories but few facts. The Joy of Cooking claims that snickerdoodles are probably German in origin, and that the name is a corruption of the German word for "snail dumpling" (Schneckennudeln, or cinnamon-dusted sweet rolls). Similarly, one author states that “the word 'snicker' may have come from a Dutch word 'snekrad', or the German word 'Schnecke', both describing a snail-like shape.” However, another author believes the name came from a New England tradition of fanciful, whimsical cookie names, and yet another cites a series of tall tales around a hero named Snickerdoodle from the early 1900s. So, there you have it. Lots of ideas, but no facts. Oh well. I guess it really doesn't matter, though, does it? They're SO tasty! And it just wouldn't be Christmas without them. They go perfectly with a cup of coffee or an ice-cold glass of milk. If you've never tried them, you simply MUST. 1. Heat oven to 400ºF. 2. Mix 1 1/2 cups sugar, the butter, shortening and eggs in large bowl. Stir in flour, cream of tartar, baking soda and salt. 3. Shape dough into 1 1/4-inch balls. Mix 1/4 cup sugar and the cinnamon. Roll balls in cinnamon-sugar mixture. Place 2 inches apart on ungreased cookie sheet. 4. Bake 8 to 10 minutes or until set. Remove from cookie sheet to wire rack. Thanx to Betty Crocker for the recipe and also for the picture! You can make them more chewy or more crunchy, depending on how long you bake them. If you like a chewier cookie, under bake them just a little. They'll be VERY soft when you take them out of the oven, but just let them cool for a few minutes before removing them to a wire rack. You'll wind up with a fabulously chewy cookie. If you like a crispy crunchy cookie, just leave them in the oven for an extra minute or so, and then let them cool on a wire rack as usual. Many cookies recipes can be doubled with no problem, but in this case, I prefer to mix each batch one at a time. I don't know why, but for some reason, I find that they turn out better.